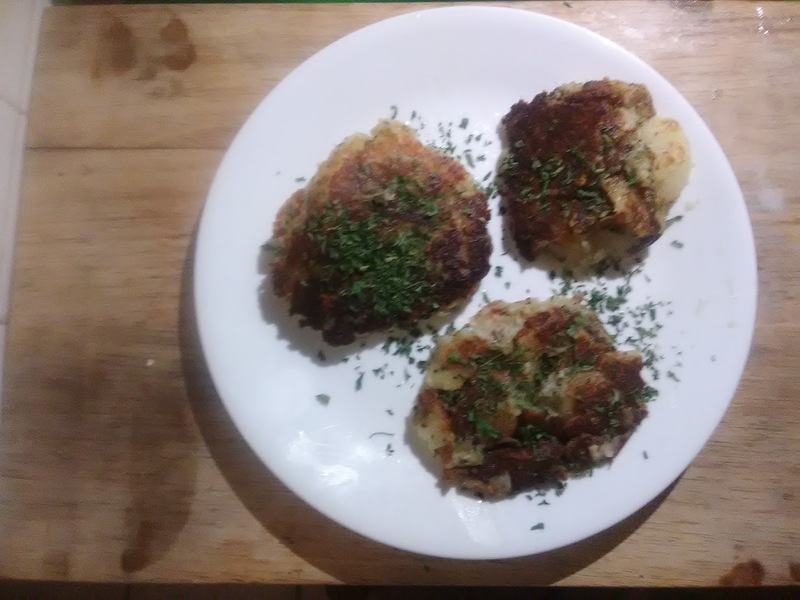 So, I decided to try my own version of the Irish potato cakes. Mine are round and a bit thick. But you can get the general idea from the pictures I included and design your own, as you choose. I used only a few ingredients -- large Irish baking potatoes, canned milk, flour, a bit of baking powder, and cooking oil. You will also need butter and the spices of your choice for flavoring. I used a Creole spice, since I'm from New Orleans, and parsley. As per usual I do not give a precise recipe since I think people can best concoct their own version at home, using a little imagination from the list of ingredients and pictures. To fix the cakes, cut up the potatoes with the skin on and boil in water until soft. Drain, mash, and mix the potatoes with enough milk to moisten the potatoes. 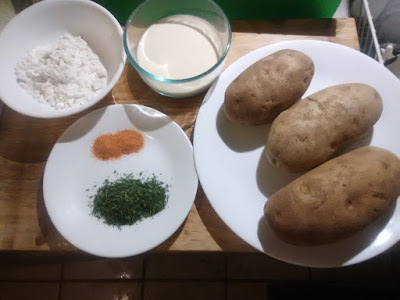 Add flour to the potato mix, in proportion of five potato to one flour, and maybe a little baking powder, if desired. Form the potato cakes into balls and smash down into cakes. Fry the cakes in a little butter or oil for about five minutes on each side. When done, serve with butter and season to taste. And that is it. It is a very simple and flavorful dish. The Irish Food Board called Bia Bord has a recipe and description of the cake here . They use a different type of potato and different spices from those on my cakes, but nothing is written in stone. Use whatever variant you like. By the way, if you cannot find a New Orleans Creole spice near where you live, you can make your own. There are many ways to do this. But an easy way is to just mix in a bowl ground black pepper, white pepper, and a very small amount of red cayenne pepper. Cayenne is very powerful. Add salt, garlic powder, and onion powder. Irish Potato Cakes can be a great addition to any meal -- breakfast lunch, or dinner. Crispy Potato Cakes at Bia Bord; Wikipedia article on Irish Potato Cakes ; Wikipedia article on Farl .